When it comes to Web 2.0 and Social Media, Facebook is definitely at the top of the heap. However, despite all of its success, Facebook is still nothing more than a place where web advertising goes to die — the futile attempts to leverage Facebook as an effective advertising medium has been well documented across the web (this recent article on Silicon Alley Insider goes into more detail as to why companies such as Proctor & Gamble are becoming more and more disillusioned with the site’s ads). But the fact of the matter is, a lot of people use Facebook a lot. So there must be some way to capture this audience, right? The problem with most Facebook ads is that either they’re nothing more than a simple banner ad, or they promote banal and predictable customer interactions such as leaving comments or submitting photos. It seems that although Facebook is supposed to be the very definition of “Web 2.0”, the ads on the site are very Stone Age in nature. That is, until Burger King came along. Instead of using a normal Facebook ad, BK has opted to market itself through a new Facebook Application — a program that must be actively installed onto the Facebook user’s profile. 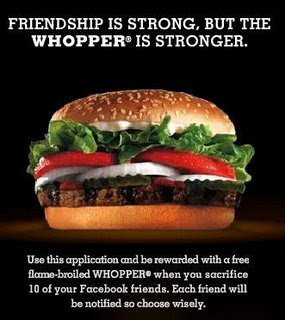 This new app, called “Whopper Sacrifice”, is offering Facebook users a free Whopper … but not by doing lame stuff like joining a group or forwarding links. Instead, you can get your free hamburger by de-friending 10 of your buddies on your Facebook account. I’ve already touched on the cleverness of Burger King’s previous marketing campaigns, and in my opinion, “Whopper Sacrifice” is nothing short of amazing. First of all, it’s getting people to actually go to Burger King to cash in their free Whopper. Second, every time you drop one of your friends, the proclamation of your burgerish loyalties is displayed on your News Feed — for all of your other friends to see (which will likely prompt a few of them to download the app themselves, thereby repeating the process … hmmmm … sounds like the very definition of viral marketing to me). Some people say that the app is pointless since you can just re-add your friends after claiming your burger. But guess what? That’s not the point. As long as the app makes you think of Burger King (and ultimately step inside the joint for your free burger), then it’s done its job. The King doesn’t care what you do with your Facebook profile after the fact. The only question is … is this the start of something good (companies actually thinking outside the box and using clever ways to utilize Facebook), or will this launch a new era of poorly-written and annoying copycat corporate applications that will flood our Facebook profiles like so many zombie, ninja, and pirate apps have in the past? Time will tell.